The NASCAR Camping World Truck Series (NCWTS) had two practice sessions on Saturday morning in preparation for Saturday night's Drivin' for Linemen 200 at Gateway Motorsports Park(GMP). Hayley was 17th, and 9th, respectively. Making his second start at GMP in the NCWTS, Hayley started 10th, and worked his way up to the sixth position before being involved in a lap 26 incident with the 51 truck in Turn 3, relegating the sophomore driver to a 24th-place finish. In 2016, Hayley has led 21 laps en route to two top-five (Atlanta & Iowa), and three top-10 finishes. In 35 career NCWTS starts, Hayley has led 99 laps en route to six top-five and 18 top-10 finishes. Hayley's ThorSport Racing teammates finished second (Rhodes), 14th (Abreu), and 27th (Crafton). Cameron Hayley, driver of the No. 13 Cabinets by Hayley Toyota Tundra, started the rain-postponed NC Education Lottery 200 at Charlotte Motor Speedway from the 18th position, when qualifying was cancelled on Friday afternoon due to weather, and the field was set based on the rule book - Thursday evening's practice times. Hayley showed strength in the first 15 laps, working his way inside the top-10 by lap 10 and scored seventh at lap 20. Fighting a loose Toyota Tundra, crew chief Eddie Troconis brought the No. 13 machine to pit road under the first caution at lap 24, for two tires, including an air pressure adjustment, and fuel. Unfortunately, problems on the right rear would cause Hayley to lose valuable track position, and restart from the 13th position on lap 28. The sophomore driver developed a vibration on the second run, and continued to battle a loose Cabinets by Hayley Toyota Tundra, but maintained a position inside the top-10. When the caution clock expired on lap 68, Hayley brought his Tundra to pit road for the second time for four tires and fuel, but another problem on the right rear forced the ThorSport Racing driver to restart 15th. In the final 63 green-flag laps, Hayley reported that the handling on his Tundra went away, and he started to get tight, but still maintained a position inside the top-10. Unfortunately, fuel mileage played a part in the final 10 laps of the 134-lap event, and Hayley was forced to pit from the ninth position on lap 122 for fuel only under green. Rejoining the field in the 16th position, the Calgary, Alberta, Canada native was able to gain one position on the track before crossing the stripe in the 15th position behind teammate and race winner, Matt Crafton. "We had another fast Toyota Tundra today. I was able to drive into the top-five twice, battling a loose handling condition, and lost it all on pit road. We just kept having trouble getting the right rear tire off on the pit stops. We will regroup, and head to Texas in a couple weeks. We are having some strong runs, just need to put it all together." Rain cancelled two of the three scheduled practice sessions on Thursday afternoon at Charlotte Motor Speedway (CMS) due to rain. Following the one-hour final practice session, Cameron Hayley, driver of the No. 13 Cabinets by Hayley Toyota Tundra, was 17th fastest of 36 trucks. Qualifying for the 14th annual NASCAR Camping World Truck Series (NCWTS) at CMS was cancelled on Friday afternoon due to weather. The 32-truck field was set based on the rule book - practice speeds - and Hayley rolled off from the 18th position for the 134-lap event. Making his second start at CMS, Hayley started 18th, ran as high as third, and finished 15th. In 2016, Hayley has led 21 laps en route to one top-five (Atlanta), and two top-10 finishes. In 32 career NCWTS starts, Hayley has led 99 laps en route to five top-five and 17 top-10 finishes. Cameron Hayley, driver of the No. 13 Cabinets by Hayley Toyota Tundra, made his second start at Kansas Speedway in Friday night's Toyota Tundra 250. Starting 15th, Hayley reported that his Tundra was tight early in the run, and swung to the loose side late in a run. The Calgary, Alberta, Canada native was scored 12th by lap 20, but fell back to 18th, due to handling, before making his way down pit road for four tires and fuel under the race's second caution at lap 45. Restarting 19th at lap 48, Hayley continued to fight handling on his Toyota Tundra, but worked his way up to the sixth position by lap 70. In an effort to maintain track position, crew chief Eddie Troconis opted to keep the sophomore driver out on the race track through the series of five ensuing quick cautions, but a long green flag run, which was eventually ended by the caution clock, followed by a lengthy time before pit road opened, due to trucks running out of fuel on the track, resulted in the No. 13 machine running out of fuel under caution. Hayley would have to be pushed back to his pit stall, ultimately losing valuable track position that he was never able to recover from, late in the race. The Cabinets by Hayley driver would eventually cross the stripe in the 19th position, behind race winner, William Byron. "Our finish tonight doesn't reflect the strong Cabinets by Hayley Toyota Tundra that we had. Eddie and all the guys worked so hard to get this thing dialed in. We were running inside the top 10 and did what we thought we needed to do to contend for a win. I feel like we would've been in good shape had it not been for that stalled truck at the entrance of pit road that forced all of us back around under caution. We just weren't able to recover from it." The NASCAR Camping World Truck Series had three practice sessions on Thursday afternoon in preparation for Friday night's Toyota Tundra 250 at Kansas Speedway. Cameron Hayley was 9th, 16th, and 3rd, respectively. Making his second start at Kansas Speedway, Hayley started 15th, led the field once for two laps, and finished 19th. Did you have anything for the winner at the end? "I think I did, and I'm beating myself up a little bit. It was a great run for our Cabinets by Hayley Tundra team - best career finish. I can't complain about that, but I just know in the back of my head if Matt Crafton was in my truck, he could have won that. I just - I needed to run a little bit harder, but great run to start up this year. This was my hardest track all year. I needed to get this one over with and to come out of here second, I'm pretty happy with the team and proud of everything Toyota, everybody has done for me. It's just an amazing start to the year." "I was just afraid to go to the high side there in one and two. I think I could have gone high, got a run on John Hunter (Nemechek) getting down the back straight and maybe passed him into three and four. I was just - my truck was not that great on the outside all day, and I was just afraid that if I went up there, I'd lose more positions than I was going to gain, but that's just part of learning and something I need to learn." What did you see from inside your Tundra when the wreck occurred? "There was a lot of wrecking in front of me and we almost got in the wreck. We definitely had an up-and-down day, had the right front almost blow there at the beginning of the race, but overall great run for our guys. They work so hard - Toyota, TRD (Toyota Racing Development), Triad, Cabinets by Hayley - all these people who help get me here. It's just a good run for our team at the start of the season." The NASCAR Camping World Truck Series (NCWTS) had three practice sessions on Friday afternoon in preparation for Saturday's Great Clips 200. 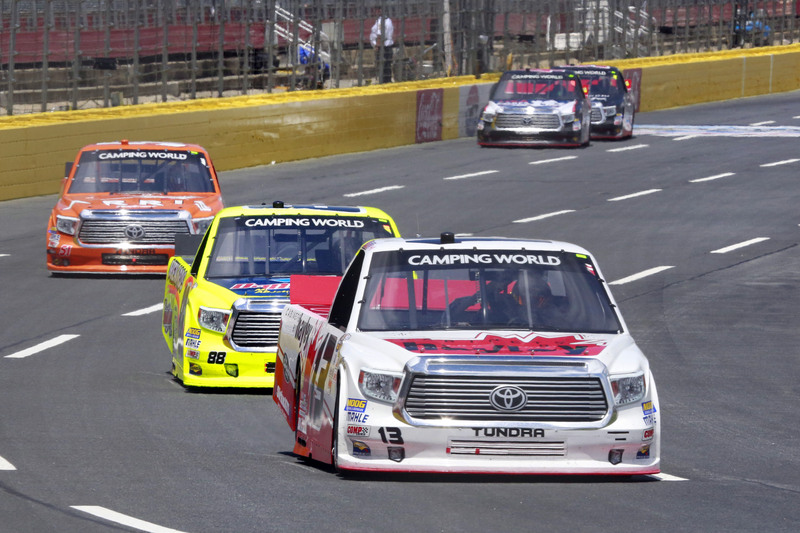 Cameron Hayley, driver of the No 13 Cabinets by Hayley Toyota Tundra was ninth, seventh, and ninth, respectively. The ThorSport Racing driver started fifth in the 130-lap event at Atlanta (Ga.) Motor Speedway (AMS) - the top-five starting position was Hayley's second in just two starts at the 1.54-mile track. Hayley finished second in the Great Clips 200 at AMS, a career-best for the sophomore driver, and his best finish of 2016. Battling a Cabinets by Hayley Toyota Tundra that was "loose through the center and off," Hayley ran inside the top-three for the first 20 laps, but experienced a vibration just past lap 30, and had to pit under green for four tires. When the first caution was displayed for the expired caution clock, Hayley would take the wave around to get back on the lead lap. Restarting 20th at lap 42, Hayley maintained a position inside the top-15 before coming to pit road at lap 61, under caution, for four tires, fuel, and a chassis adjustment to tighten-up his No. 13 Toyota Tundra. The ThorSport Racing driver would restart 12th at the lap 68. Following the races half-way mark, Hayley reported that his Toyota Tundra was, "tight in the center of both corners," but Hayley was able to work his way inside the top-10, running seventh, when the caution clock expired at lap 107. Crew chief Eddie Troconis brought the Cabinets by Hayley machine to pit road for the final time, for four tires, fuel and a wedge adjustment and would line-up seventh for the lap 111 restart. Hayley took the lead on lap 112 after nearly missing a four-truck pile-up that brought out the red flag for more than six minutes - leading four laps - before losing ground to the No. 4 machine with 14 laps remaining. In the final 14 laps, Hayley survived the final caution of the night for the 4 truck, who was leading at the time, to finish second behind race winner, John Hunter Nemechek. In 28 career NCWTS starts, Hayley has five top-five and 16 top-10 finishes. Hayley was the highest-finishing Tundra driver in the Great Clips 200 at AMS. What are your thoughts on Atlanta? You're going back for the second time this year; do you feel better about the track? "Atlanta was probably one of my biggest struggles last year. Daytona is kind of an exhibition race, there's not a whole lot of handling that goes into it. Atlanta will be the first race that Eddie (Troconis), my new crew chief and I, will get to know each other, and how each other works. We've definitely been working really hard, as a pair, to get to know what each other wants - just knowing what changes he needs to make off of what I'm feeling. It's definitely a difficult race track, I have a lot to learn, but hopefully I can take what I learned last year and apply it to this year." Is it difficult going back to a track you haven't seen in 365 days? "It's difficult going back to a place, like Atlanta, that you only visit once a year. I made a lot of notes last year, so I have that to look back on. I'm pretty good at remembering the track layouts, but I'm sure there are things that I'll have to re-learn again once I get there. Like I said earlier, Atlanta is one of the first real race tracks that we have to worry about handling, and tire management, but I'm looking forward to it." Chassis Information...The No. 13 ThorSport Racing team will utilize chassis No. 35 for Saturday's Great Clips 200 at Atlanta (Ga.) Motor Speedway (AMS). This particular chassis was utilized by Matt Crafton in 2015 at Kansas Speedway in Kansas City, KS and Michigan International Speedway (MIS) in Brooklyn. Crafton started second in Kansas, led six laps and won, and started on the pole in Michigan, and finished sixth. Atlanta Fast Facts... Cameron Hayley has one start at AMS in 2015. The Calgary, Alberta, Canada native started third in his track debut, and finished 14th, completing 129 of 130 laps attempted. Daytona Recap... Hayley started 14th, led four laps with an Average Running Position of 8.98, and finished 25th after being collected in a lap 94 accident involving 18 trucks in Turn 3. The sophomore driver ranked fifth in Driver Rating with an 89.0, third in Laps in the Top 15 with 89, and first in Quality Passes with 161.